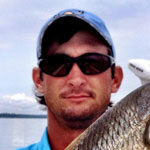 Guide Chris Bullock likes to target prespawn and postspawn crappie on Kerr Lake throughout April. 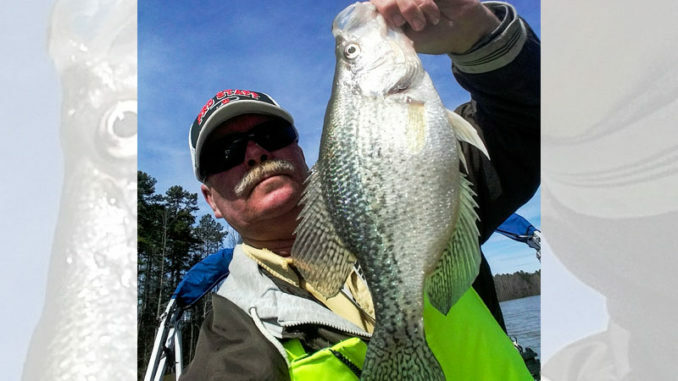 According to guide Chris Bullock of Fountain, N.C., Kerr Lake crappie will be on the move this month. Some early spawners will be leaving the shallow flats in the backs of the creeks. But new arrivals will be coming in daily to fill their place. To take advantage of the transfer, Bullock sets up in the middle. From there, he catches them coming and going by long-line trolling. 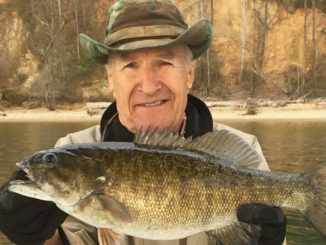 Depending on rainfall and water clarity, Bullock (252-902-4039) believes the bite to fire up faster in the northern creeks above Clarksville, Va. — Buffalo and Bluestone — and progress southward through the month. But if rain dirties the waters, these will be the first to experience it. And that will force anglers down to mid-lake creeks like Grassy, Big Beaver Pond, and Panhandle. Eventually, the bite will wind up on the lower end in Butchers, Mill or Eastland, which is the lowest Bullock will long-line because the water there is too clear. 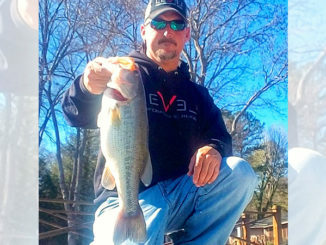 Bullock pulls a spread of 8 to 12 rods and reels spooled with 6-pound monofilament. To put distance between the baits, he uses rods ranging from 6 to 16 feet in length, with the shortest closest to the transom. 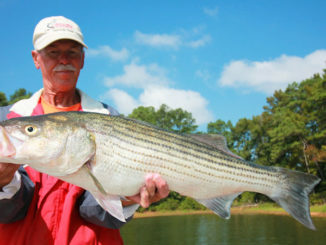 To start, he uses a wide range of jig colors and body styles — curly, straight and paddletail. Then he hones in on what the fish are wanting. But his secret weapon is dying the minnows that tip his jigs with Pautzke Bait Company’s chartreuse Fire Dye.